Sitting quietly on top of the Caelian Hill in Rome are the Case Romane del Celio snapshots of early Roman history showing the changes that time and the rise of Christianity brought to the city. Twenty rooms are preserved under a 4th century basilica, each serving as evidence for their former uses over the years as homes, shops, and even as a Christian shrine. 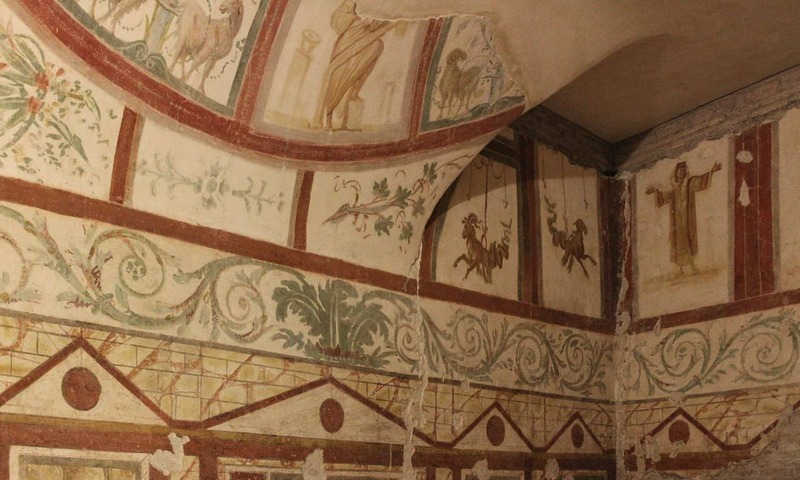 Decorated with a unique mix of pagan and early Christian frescoes, these rooms allow visitors a beautiful glimpse into ancient Roman homes and daily life. Frescoes covering the 'Orans Room,' named for the praying figure in the upper right. There is no lack of incredible historic sites to see in Rome. Visitors to Rome often find themselves overloaded with images and monuments to the city’s historic past. These more famous sites are typically crowded and overwhelming, limiting how visitors can interact with the past surrounding them. In the Forum, you’re almost more overwhelmed by the crowd than you are impressed by the site itself. Here, you can lose yourself in the past in a way that you can’t anywhere else. 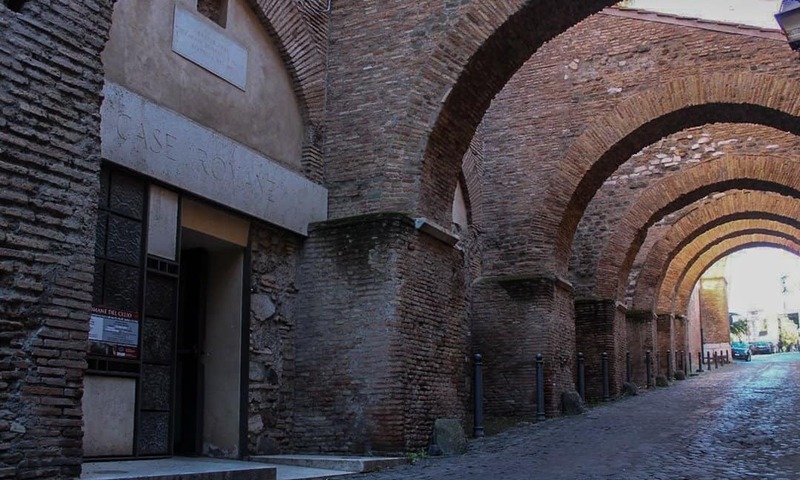 The buildings that make up the Case Romane del Celio are located on top of Caelian Hill, one of the famous seven hills of Rome, long known as the home for some of Rome’s wealthiest elites. The earliest structures that make up the Case Romane del Celio date from the second century AD when the buildings at this site were part of an early roman domus or residential building for Rome’s upper class. At the beginning of the third century AD, the site was transformed into an insula or middle-class apartment block. Artisan shops took up the bottom floors with apartments above them, going along a small alley which still cuts through the site today. In the early 4th century, the site saw its another major transformation when the entire area was acquired by a wealthy family who combined all of the buildings into one large and elegant domus. The owners of this new house were much wealthier than any of the previous owners, and they decorated the house with beautiful frescos showing nature and pagan symbols. By the second half of the fourth century, the Christian martyrs, Saint John and Saint Paul, took up residencies in the site where they were later martyred and buried. Three other Christian martyrs–Crispus, Srispianus, and Benedicta– are also supposed to have been buried at this site after assisting and praying with Saint John and Saint Paul. A close-up of the shrine for the martyrs, depicting two Roman soldiers leading Crispus, Srispianus, and Benedicta to their death. A confessional shrine with frescoes featuring all of these figures sits in Case Romane marking the place of burial for these Christian martyrs. This shrine became a pilgrimage site, a separate staircase was even built to help the flow of pilgrims coming through to pray at this small shrine. At the beginning of the 5th century, a Roman Senator gave the orders to create a Christian basilica on top of the site, dedicated to the martyrs who lay beneath. The foundations of this new basilica were built on this site, cutting through the rooms beneath and leaving the area largely blocked off and unusable. The majority of the site was forgotten about apart from a few rooms that were used by the basilica for storage, and a small room which was transformed into a Medieval oratory with new frescoes covering the walls. This was the final transformation that the site would see until its excavation several centuries later. 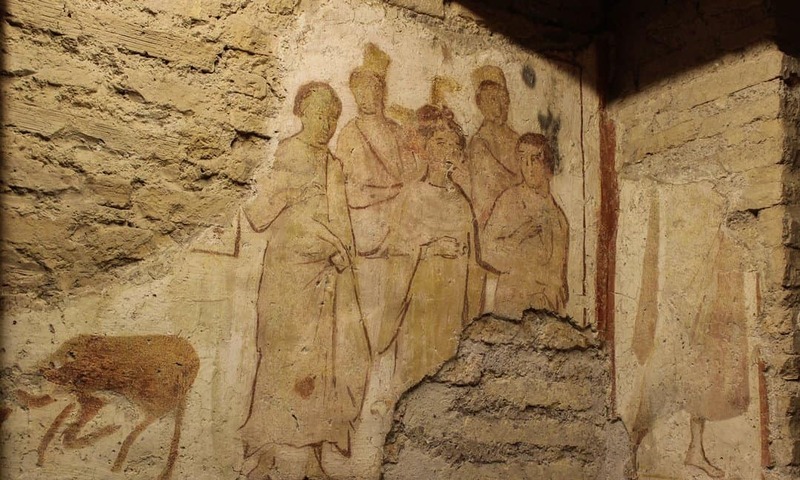 In 1887, a Passionist brother and priest ventured beneath the chancel of the basilica searching for the tombs of Saint John and Saint Paul and stumbled upon a series of large rooms decorated with ancient frescoes hidden by a layer of lime. Since this discovery, extensive excavations and restorations have taken place, and for several decades throughout the 20th century, the space was even used as a place of worship. At the end of the 20th century, the site was taken over by the Fondo Edifici de Culto, a part of the Italian Ministry of Internal Affairs which finished the excavations and opened the site to the public in 2002. A visit to the site takes you on a trip through time as you travel through rooms which show their various purposes over the centuries, each superimposed on top of another. After purchasing your ticket to the site, you enter a medieval oratory, the only part of the site used after the fourth century. This small chapel would have originally been covered with frescoes depicting the life of Christ, even heading up the small spiral staircase which is barely wide enough for a person to fit in. 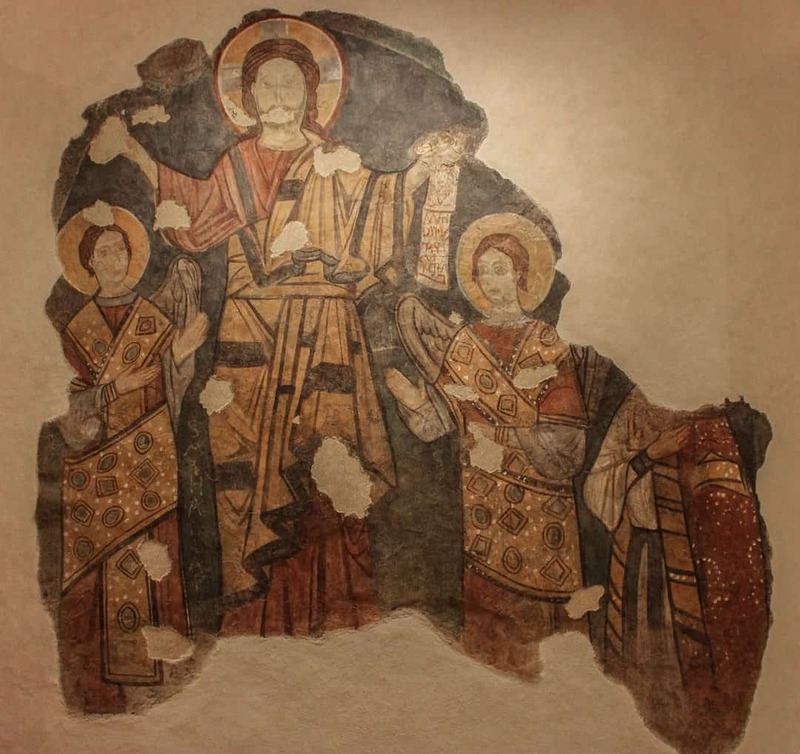 These frescoes were in a delicate condition when they were discovered, the largest of them – a fresco of Christ resurrected – had to be moved to the museum at the back of the site to preserve it. From this room you head deeper into the site, back hundreds of years in the past into a maze of ancient Roman houses. A guardian spirit surrounded by wild birds and floral wreaths. The next room you enter would have originally been the main room of a 2nd century shop. As you pass through into what would have been the store’s back room, you can see the dramatic transformation that occurred when the entire space was turned into an elegant domus in the 4th century. What would originally have been a purely functional space was converted into a place of beauty with frescoes of pagan guardian spirits in nature. In the 4th century, this room would have extended even further, opening up into a courtyard that is now separated by a foundation wall. Signifying the former use of this room and many of the others as having been part of workshops, are small drains in the corners which were never covered up in subsequent transformations. As you continue through your visit, you pass through rooms featuring a unique style of frescoes which attempt to imitate the look of marble. Even for the wealthy family that owned the site real marble wall decorations would have been too expensive, so imitation frescos were used as a substitute. 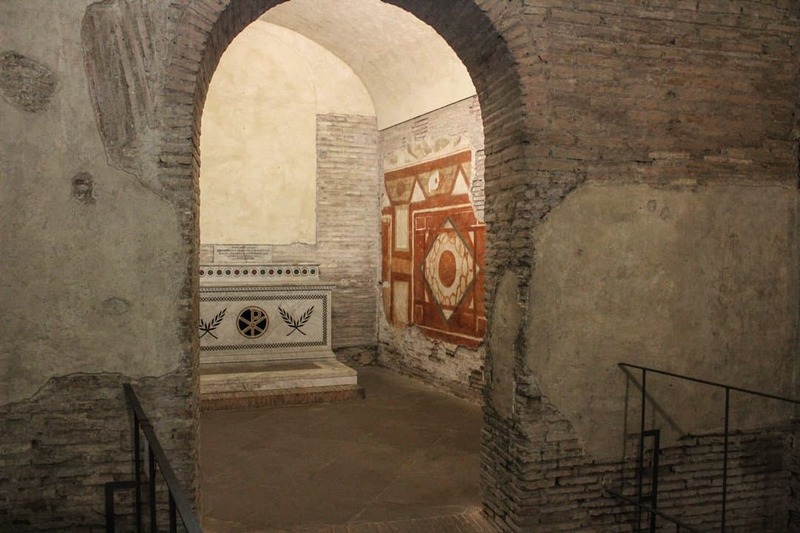 These rooms also have Christian altars and plaques in them, not from the ancient period, but from the early 20th century when the site was used as a place of worship by the basilica. A view into a room with imitation marble frescoes and a 20th century altar. Passing these faux-marble walls, you enter two of the most beautiful rooms in the site, the room of the orans and the room of Apis and Bacchae. The bottoms of these walls feature the same imitation marble as the previous rooms, but the tops feature much more intricate images of ancient Roman culture. The names of the rooms come from depictions of the pagan gods Apis and Bacchae, and a female figure in an orans or worshipping position; but also, they depict sea monsters, theater masks, philosophers, and a minor pagan god Silenus. One of the best preserved and most interesting of these images is the orans figure who is often interpreted as being a Christian figure in the midst of various pagan images. In sharp contrast to these beautiful rooms, the following rooms have little or no decoration, signifying that they would have been used largely by the servants within the house. Along the route, you pass by a wine cellar where pieces of ancient amphoras still stick out of the ground and along a corridor which had formerly been an alley before it was absorbed into the house in the 4th century. At the end of the alley, stairs lead you up to one of the most notable parts of the site, the confessio. This small oratory shrine is covered in frescoes depicting Saint John and Saint Paul as well as the martyring of Crispus, Srispianus, and Benedicta. Supposedly buried in the vicinity are the saints, and a box which possibly contains their remains. Heading down the stairs leads you along a small passageway opening up to the Nymphaeum. This room would have originally been an open-air courtyard complete with fountains and a well and would have connected to one of the first rooms of the site. Covering the main wall of the room is a large fresco showing the Roman god Proserpine (Persephone in Greek Mythology) in what is generally interpreted as the return of spring. Proserpine is depicted returning from the underworld in a small boat, flanked by two other pagan deities and surrounded by various cherubs and water nymphs. A beautiful arrangement of coloured marble tiles the floor, leading into a small room on the side with more detailed mosaics on the floor. The fresco of Proserpine in the Nymphaeum. As you move on from the Nymphaeum, you walk along a catwalk from which you can see into the depths of the site; ancient staircases and walls cross the area, but at the bottom, you can make out a large early Roman bath, with beautiful marble tiles surrounding it. At the time of writing this area is currently still undergoing further excavations, but the catwalk provides a good view down. Crossing the catwalk leads you into a much more modern staircase, at the top of which is the site’s museum. This museum was just completed in 2002 and does an excellent job of presenting various artifacts from the site’s excavation including amphoras, pillar toppers, and a large fresco from the Medieval oratory. Many of the objects within the museum are not directly from the sites past as roman houses but rather come from the centuries afterwards, when the site was forgotten about and used as storage or as a place to put objects that were no longer needed. A medieval fresco of Christ risen displayed in the museum. Case Romane del Celio is located near the top of Caelian Hill along Clivo di Scauro, a historic Roman road which keeps its original name. It is roughly equidistant between the metro stops Colosseo and Circo Massimo along the B line and only about a five to ten minutes’ walk away from the Colosseum or Roman Forum. The site’s proximity to various other historical sites makes it an easy stop to add when visiting these other places. Although the site is located underneath the Basilica of Saint John and Saint Paul, it is not affiliated with the basilica and there is no dress requirement for entry. However, the basilica above is also beautiful and worth a visit and does not allow those inside who they deem to be dressed immodestly. The entrance to the Case Romane along Clivo di Scauro, an ancient Roman Road that has kept its original name. All of the signs and markers within the Case Romane del Celio are in both English and Italian. For more information, a small informational guide can be purchased for 4€, and a free app about the site is also available for download. Be aware, that as one of Rome’s smaller sites, not all of the employees are completely fluent in English, but the information is available in various languages. At the time of writing, the Case Romane del Celio is open every day except Tuesday and Wednesday from 10am-1pm and 3pm-6pm. Tickets are 8€ for adults, free for children under 12, and reduced to 6€ for teachers, students, those with disabilities, and those under 18. The site is unfortunately not part of the Roma Pass program. Groups larger than 10 must make reservations with the site which costs 25€ but receive discounted ticket prices. Guided group tours of the site are also available in Italian (100€) and other languages (110€). For further information regarding tickets and hours, you can visit the official website, which is available in both English and Italian. You can also call the main office at (+39 0670454544). In addition to these regular visits, the site also hosts a number of different special events throughout the year. The most notable special events are their evening visits which features a guided tour followed by a light meal of aperitivos made based on ancient Roman recipes. Guests also enjoy theatrical interludes throughout the meal. These events are conducted in both Italian and English and happen several times throughout the year, but they can also be done upon request as well. Prices and dates of these visits can be found by visiting the site’s website or by calling its phone number listed above. 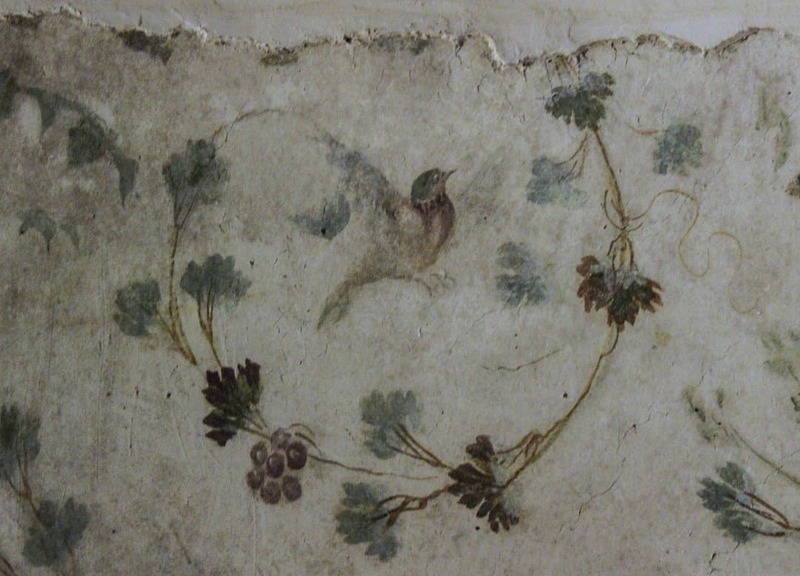 A fresco of a bird in flight surrounded by wild flowers. Where is Case Romane del Celio? Case Romane del Celio is situated on the Clivo di Scauro on the sloped of the Caelian Hill, roughly half way between the Colosseum and the Circus Maximus. For those travelling into the city by Metro, use either the Colosseo and Circo Massimo stops on the B line. 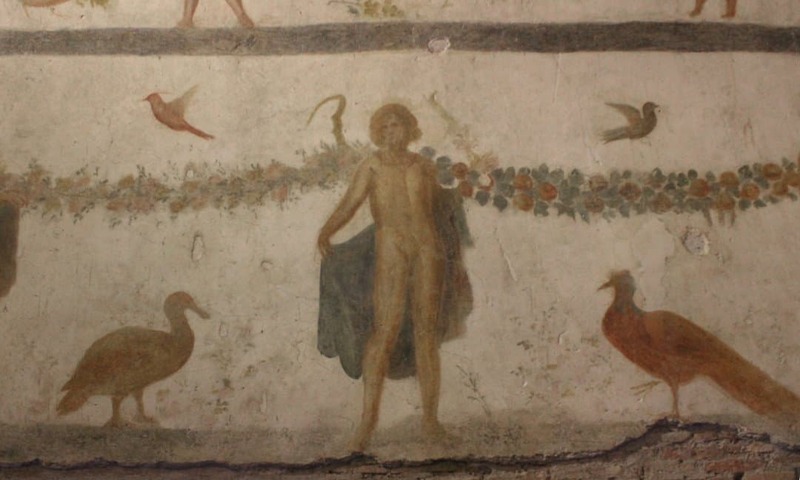 So You Want to See a Mithraeum in Rome? PreviousBuying Historical Gift Experiences: Heritage & Experiences are Terrific for our Well-Being! I have been interning at the Case Romane during my semester abroad here in Rome as I pursue a BA in history at Trinity College (CT). Living and working in a beautiful and crazy place like Rome with history around every corner has only increased my passion for the past (and tested my extremely mediocre Italian). When I’m not living out my dreams abroad, I love to hike whenever I can, explore historical sites at home in the US, and go for long walks with my dog.